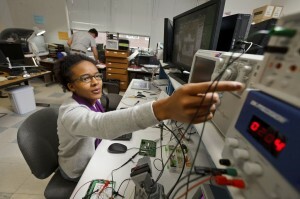 The Computer Engineering Lab (MCT163) supports the Department’s computer engineering activities. There are three major components to the lab. The Fabrication Line, the Testing & Development Stations, and the Reference Board Library. The lab is open for general use during normal academic hours. Faculty coordinate 24×7 access for students who need access to the lab to complete projects. Our students use the equipment in this part of the lab to fabricate custom circuit boards. Students get hands-on experience with the fabrication processing, going from blank copper plate to completed circuit board. The majority of the equipment was purchased from LPKF, Inc, and was selected because it is the state of the art in mechanical circuit structuring, and is largely chemical free; which is important for student safety and reducing the environmental footprint of the process. Mill custom circuit boards from copper plated FR4. Feature sizes down to 4 mil (.1mm). 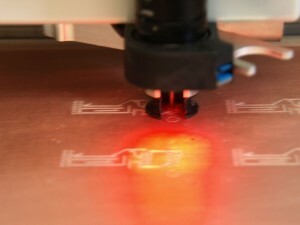 Also allows computer aided drilling and contour routing of various materials and 2.5D manufacturing. Semi-automatic Pick and Place machine allows accurate placement of parts on a circuit board. Stereoscopic microscope and integrated heaters facilitate accurate placement of BGA, QFN, and other parts. Extensive array of components for students to use on projects. 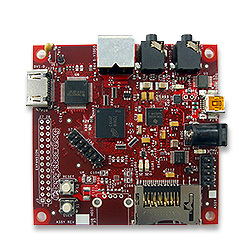 Parts library includes wide array of new parts, as well as a collection of boards students can use for salvage and to study existing system boards. National Instruments LabView / Tektronix ed. Our licensing agreements allows the software to be installed on all of our departmental machines, and some of the software can be installed on students’ personal machines. This machine can build a Linux kernel from source in less than 1 minute!